Nocturia is major problem in most of the population in different regions, as the condition for causing nocturia basically depends on ageing of the patient, incidences of chronic diseases such as diabetes or any other factors. Nocturia affects people of all age groups right from children to old people. In medical science, nocturia is known as excessive urination at night where the body produces more urine during sleep time. Nocturia affects the productivity of people suffering from the condition during working hours as well. Persistence Market Research uses a unique research methodology which is a strong blend of secondary and in-depth primary research. Extensive primary interviews with key market players, stakeholders, market observers and experts are carried out to collect necessary data and information pertaining to various segments and across key regions. The data crunching and statistical analysis so performed undergoes multiple layers of validation to garner appropriate market insights which could benefit business by impacting critical decisions. The exhaustive research methodology has been applied to thoroughly understand and study the market for nocturia and the findings and insights have been skilfully crafted following a systematic structure in the new report titled “Nocturia Market: Global Industry Analysis (2012-2016) and Forecast (2017-2026)”. The global nocturia market research study covers competitive landscape that includes market shares, revenues, growth strategies applied, product portfolio analysis, distribution channels, expansion in several geographies, marketing strategies, SWOT analysis, pricing analysis, etc., of the various key players in the global nocturia market. Such an intelligence framework can be used to gain competitive advantage in the long run, especially helpful for new entrants in the nocturia market. This Persistence Market Research (PMR) report features the ‘Global Nocturia Market’ for the period 2017–2026. The report objective is to offer updates on the ongoing market trends and information regarding market opportunities in the global nocturia market. The primary objective of the report is to offer insights into developments in the Nocturia market that are significantly transforming global businesses and enterprises. Rise in prevalence of cancer, diabetes, and cardiovascular disease globally are important factors that are responsible for the growth in revenue of the nocturia market. A significant percentage of population is affected by the aforementioned diseases. Greater access to manufacturing infrastructure, increased access to Contract Manufacturing Organizations (CMOs) and advancement in drug delivery systems are the factors expected to drive revenue growth of the nocturia market globally. Furthermore, high operational costs, discontinuation of product manufacturing due to competition from low cost manufacturers are hampering growth of this market. This report uncovers the global nocturia market performance concerning revenue contribution from various segments. This section also comprises of PMR analysis of key trends, drivers, challenges, and opportunities, which are influencing the growth of the global Nocturia market. Impact analysis of the key growth drivers and restraints are included in this report to better provide clients with decision-making insights. 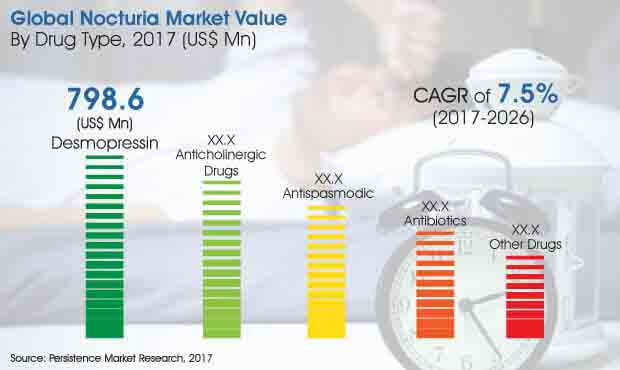 The nocturia market report provides an overview of the market. This section also underlines factors influencing the growth of Nocturia market along with detailing of the key trends, drivers, challenges, and opportunities. Impact analysis of the trends is included in the report to better clients with information and insights. Distinguishing features of the report includes a list of major vendors manufacturing workstations, drivers, and restraints regional impact analysis, and competitive dashboard. Furthermore, PMR provides a competitive landscape to the companies and their strategic developments. Desmopressin drug type segment is expected to be the largest segment and is projected to grow at a CAGR of 6.5% throughout the period of forecast. This segment reflected a high value a bit under than US$ 800 Mn in 2017 and is estimated to reach a market valuation higher than US$ 1400 Mn by the end of the year of assessment. In the final section of the nocturia market report, ‘Competitive Landscape' section is included to provide a detailed analysis with a dashboard view, to access the key differentiators among the competitor firms. Detailed profiles of major manufacturing companies is included with company-specific long-term and short-term strategies, company profiles are equipped with their product offerings and recent developments in the Nocturia market. Key companies covered in the report are Allergan, Inc., Urigen Pharmaceuticals, Ferring Pharmaceuticals, Glenmark Pharmaceuticals Inc., Teva Pharmaceutical Industries Ltd., AA Pharma Inc. and Avadel Pharmaceuticals plc.